The three-day Shandur Polo Festival 2018 will be held at the world's highest Polo Ground at Chitral from 7 to 9 July. 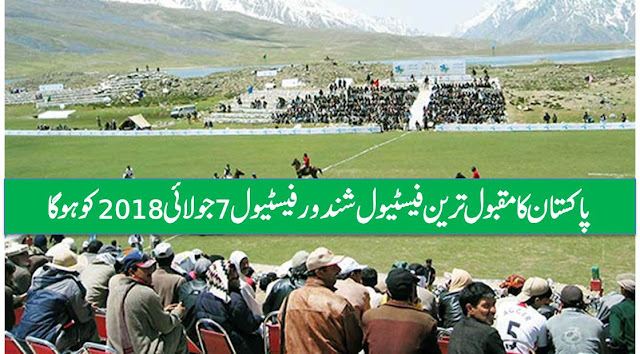 Provincial minister Tourism Fida Khan said, Shandur Polo Festival management has invited visitors and tourists from across the Globe to experience a traditional polo tournament between the teams of Chitral and Gilgit Baltistan, Radio pakistan reported. The government and district administration had made foolproof security arrangements and provided all the facilities to visitors to make the festival a success, he added. Apart from polo game, other traditional games of Chitral and Gilgit-Baltistan, paragliding competitions and musical shows have been arranged to entertain the visitors.